The explosion of new spaces for overnight stays has given travelers many more options. While the large hotel industry is not yet worried, local municipalities are starting to rethink how their hotel/motel tax is collected. They should. Over 30 million people have used Airbnb since it started six years ago. VRBO and Homeaway have been stealing customers from hotels for even longer, causing a dip in tax revenues. Over the last 5 years, I’ve used VRBO and Airbnb on numerous occasions – New Orleans shotgun house, recently renovated apartment in Siracusa, Italy, farmhouse in Tuscany, attic apartment in Paris, France, and a small garage apartment in Albuquerque. They have been positive experiences with only a few surprises. 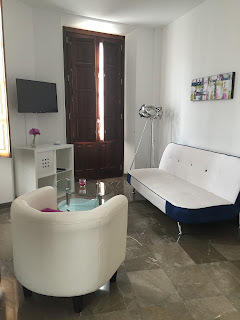 We recently explored Spain and decided in advance to only use VRBO and Airbnbs, rather than a mix of both. It was a hard decision as I do love the small, charming hotels in Europe which are very difficult to locate in the U.S. But we needed at least two bedrooms and the apartment scenario seemed more appropriate. Here’s our take from our trip. Allowed possibility for bringing in food for breakfast and other meals. All had coffee makers and most provided coffee and tea. We ate breakfast in almost every morning and brought dinner in twice. And that cheese and crackers with a bottle of wine was great in the late afternoon. Hosts were helpful – some more than others. It was nice to get one who spent time pouring over a map to be sure we were oriented and could make restaurant suggestions, etc. Felt more a part of the city and neighborhood. Easier communication among us traveling. With 2 or three hotel rooms, we would have had to use phones or go the rooms to communicate. Washing machines were available in two apartments which was helpful. We had balconies in three of the four apartments – a lovely addition. Wifi was available in all. Had booking fees but am not sure if the stay was subject to local taxes. Had some issues with neighboring apartment noise and street chatter. What we missed in not having a hotel. Always someone there to check you in. For the apartment, you have to coordinate arrival times which can be tricky in a foreign country, especially if you can’t use your phone easily. Whatsapp was a very popular app for communicating with landlords. Extra keys are available if you lose yours or leave them inside. Most apartments had two sets of keys which was enough for this trip. Has regular maid service with clean towels, extra pillows, etc. More likely to have lots of TV stations. Could change rooms if your room were loud. Stay in a hotel the first and last stop for easy check-in and to be assured of a good night of sleep. Use the apartment route if you are more than 2 or 3 persons. Use the hotel for one night stays and apartments for 3 or more nights. For two nights, it depends. Be prepared for communication with landlords. It should be worked out in advance. 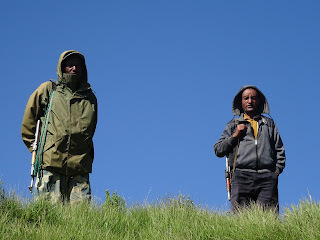 On a beautiful, fall morning, our guide, Muchaw Derebe, picked us up for the thirty minute drive to the Lalibela Airport. 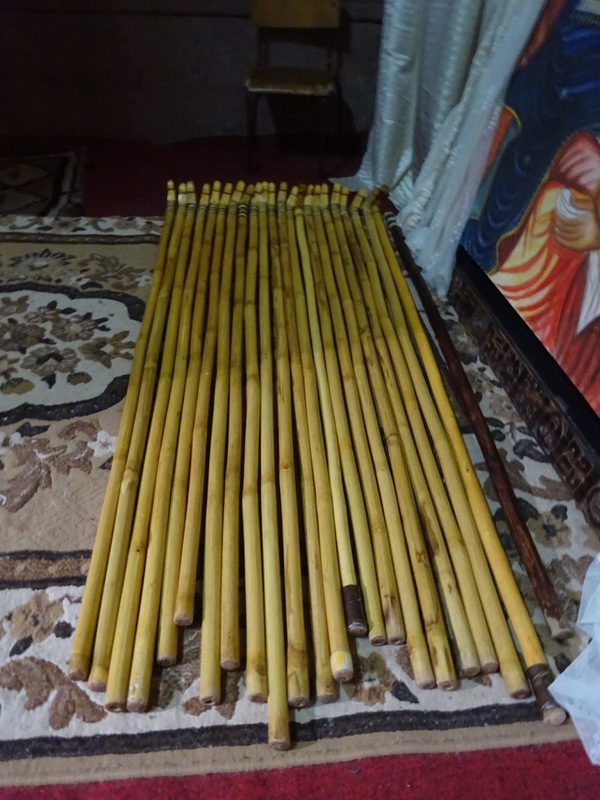 Seven stops were made along the road to take pictures – of farmers using oxen to plow the fields, distinctive circular Orthodox churches, Chinese working on the roads, and children eager to be photographed. It was a leisurely drive and we arrived with time to spare. 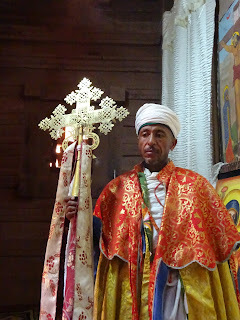 Our next stop was Axum where the acclaimed Ark of the Covenant resides in a chapel, accompanied only by a solitary priest. 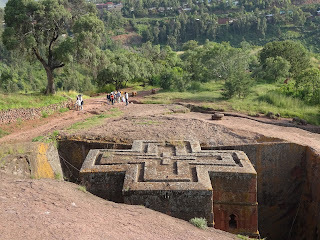 We were also looking forward to meeting up with some fellow travelers, seeing obelisks and stelae from ancient Aksum, and attending a local wedding, all followed by a drive through the back mountains of Ethiopia. The long awaited plans were coming together. 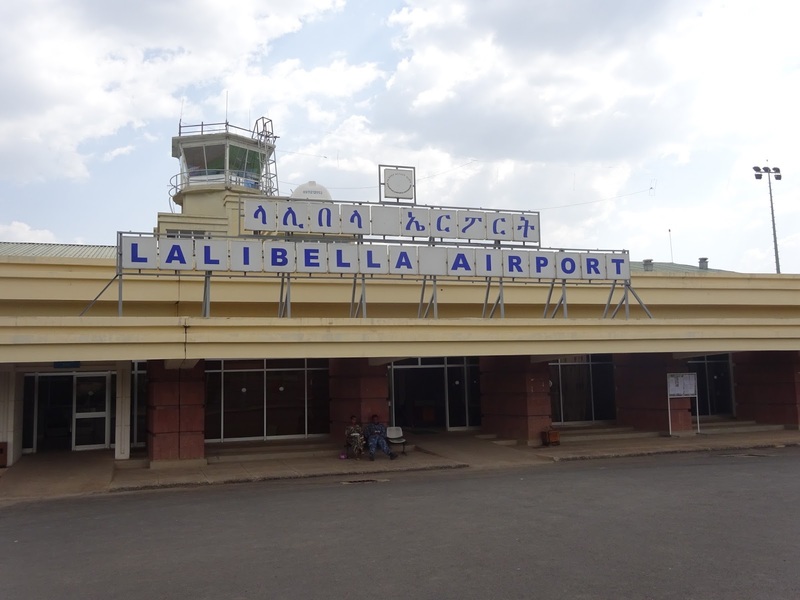 The Lalibela Airport is modest in size but spectacular in location. A large plateau hosts the runways and in the distance mountains and valleys lie in shadows. 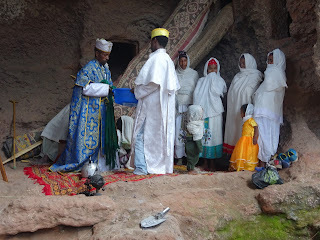 Only one couple waited with us for the flight to Axum. Departure time of 9:35 am came and went. A new group of travelers filled the waiting room and left on their plane. Inquiries yielded limited information. Our plane had mechanical difficulties and needed a mechanic and part flown to Gondar, where the plane waited. Two to three hour delay expected. Anxiety set in. One small café upstairs offered minimal food and drink with most listed on the menu unavailable, including milk. 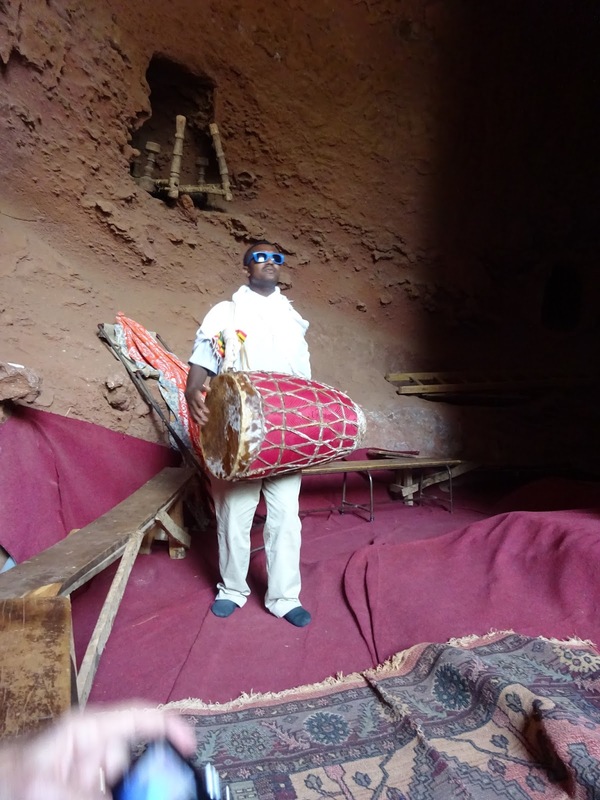 Our guide surprised us when he returned upon hearing of our delay and had four large bottle of water in tow. We settled in for the wait. 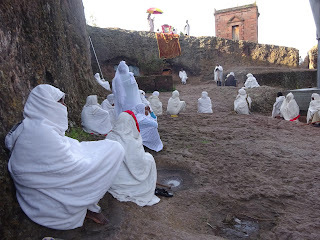 I reviewed my pictures with Muchaw in order to correctly identify the various churches in Lalibela. We took a couple of walks outside the airport, noting recent plantings along the driveway. Guards waved us in as we returned, recognizing our faces by now. In the lobby, CNN played on a very small television next to a dead palm tree. 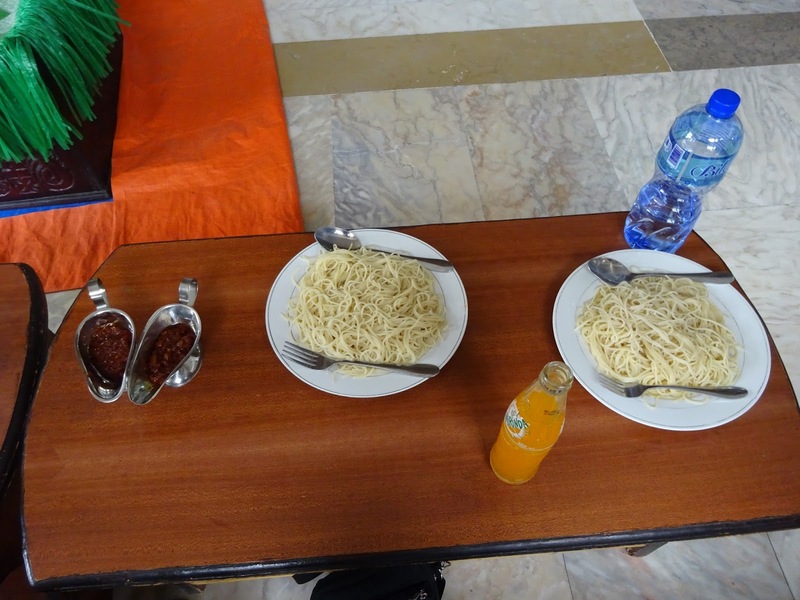 At 3 p.m., the airline served us pasta with a spicy red sauce. More stranded travelers had filled the lobby throughout the day, an international group from the United Kingdom, the United States, Israel, and Japan. With English as our common language, we visited across country lines. At 4 p.m., a rumor circulated that the plane was in the air but at 5:20, the flight was officially canceled due to bad weather at our destination – eight hours after our scheduled take-off. Our now enlarged group climbed into a waiting van and more visiting took place. The British couple lived apart – the husband measured public opinion in Baghdad while the wife lived in London. Two young Israeli girls were traveling for seven months after serving in the military, an accepted practice in many families. My Japanese chemical engineer seatmate wanted to know how many countries I had been to. And across the aisle, I talked with the other Japanese, a woman who worked in their embassy. The return trip to Lalibela passed quickly. Each of us got our own hotel room in a round thatched roof building. Dinner was also on the airline. Many of our travelers gathered for a drink before eating and continued the visiting. Our guide had other plans for us. Muchaw wanted a happy ending to such a long day. 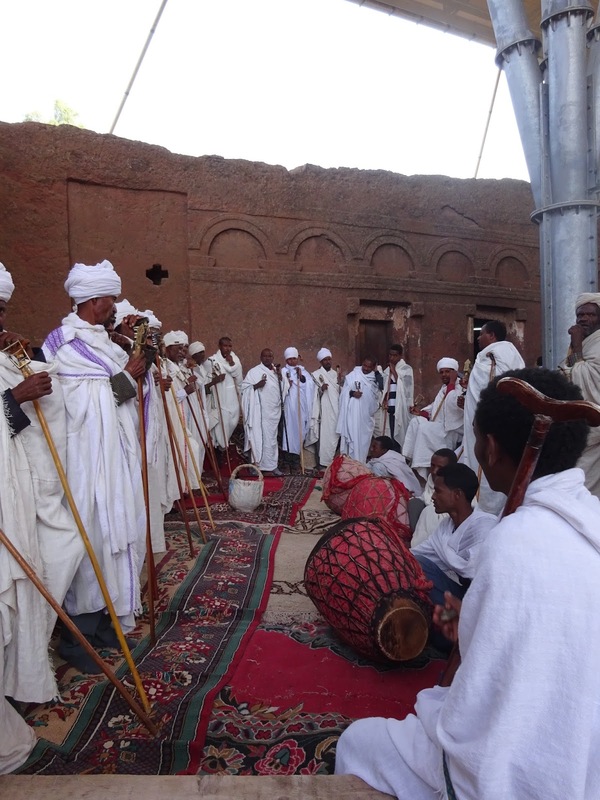 At 8 p.m., he picked us up and we drove to the Torpido for a true Ethiopian culture experience in a part bar, part dance hall. We entered the incense infused gathering place found down an alley. Red Christmas lights dimly lit the space while small tables circled an open area. Honey wine with three levels of alcohol was served. All smiled at us as we followed Muchaw to a table and sat facing the center. 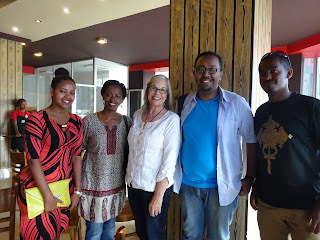 Soon, a beautiful singer and the accompanist on a one string masenquo entered and began singing, circling the room and incorporating funny comments into the music about the familiar clientele – a kind of Ethiopian rap. All laughed and clapped. Muchaw translated for us but sometimes was laughing too hard to do so. The singer even stopped at our table and sang about our beautiful country and how much she loved America. 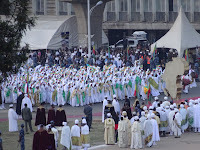 Many stood to dance the shoulder shaking Ethiopian style called the eskusta. We couldn’t stop smiling. The next morning, we gathered with our new friends for breakfast, drove the now familiar road to the airport and held our breath until our plane took off. Because of time constraints, we had to rearrange our itinerary. 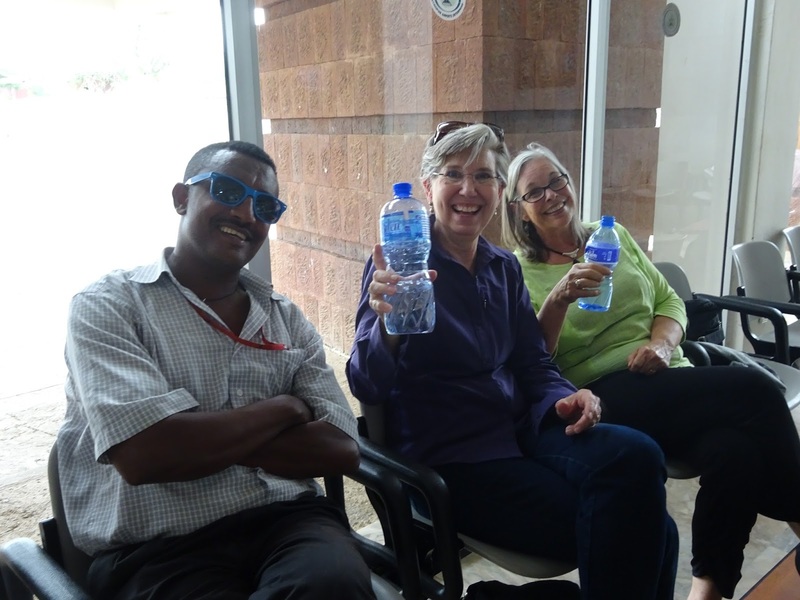 At the Gondar Airport, we hugged the Israeli girls and the American couple and waved at the rest before entering a waiting taxi. 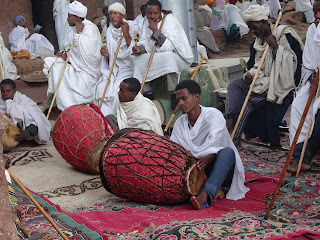 Yes, we missed Axum and the wedding and the drive through the mountains but we passed a unique and unscripted day with new friends and experiences. It fit my long held belief that the worst travel experiences can result in the best travel stories. This was one of the best. The approach to Simien National Park from Debark, Ethiopia on a newly constructed gravel road is, at first, one filled with jagged mountain tops and plateaus. But upon encountering the plunge into valleys below, only our Grand Canyon seems comparable. Created by massive erosion, the layers of mountains, plateaus and valleys stretch for miles. Dizzying drops in altitude lie below edges of the escarpment’s grass fields. Distant shadows hint at hidden rivers. 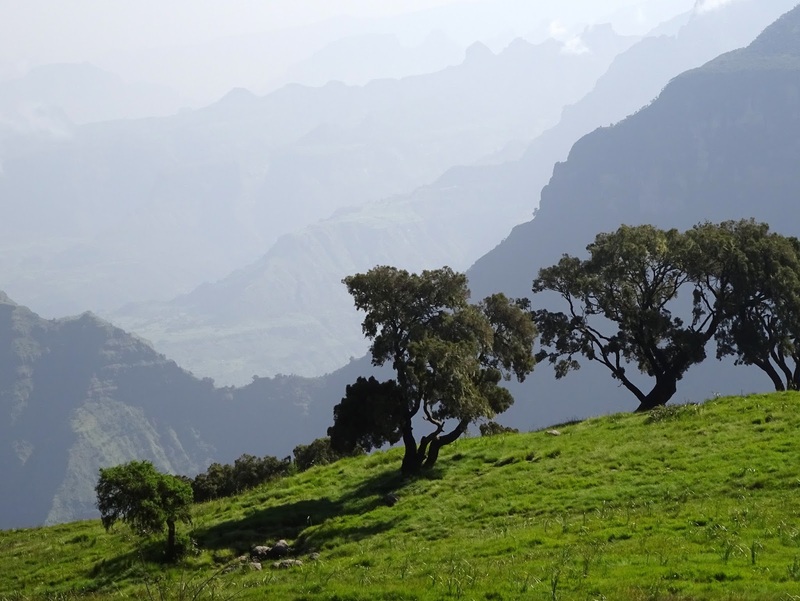 The Park contains the highest peak in Ethiopia at 15,000 feet and Africa’s highest hotel. The scenery would have been enough but we hoped to encounter some of the park’s unique animal life. We were lucky. The week before had been cold and misty but this week was clear with almost no one on the roads. 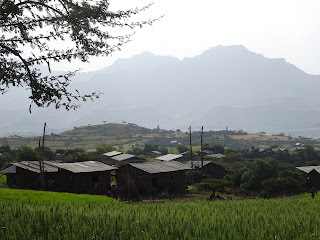 Our arrival corresponded with the end of the rainy season but before dry season when tourists arrive to backpack through mountains and gorges. Our van simply stopped by the side of the road leaving us to walk across the mountain side, sometimes on a trail but often through grass fields. The endangered Ethiopian fox and Walia ibex, a wild goat, are rare sightings and stayed hidden from us. 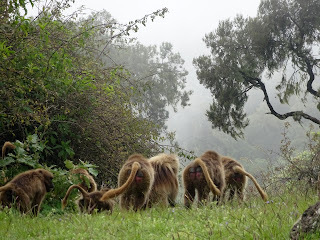 In higher numbers are the Gelada Baboons, nature’s only primates that are primarily grazers. They are more closely related to monkeys than the aggressive African cousins. Their numbers have increased from 3000 to 5000 in the park. 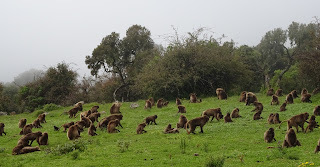 These baboons spend nights on cliff ledges and emerge in the mornings on to plateau tops to feed and socialize. That is exactly where we found a herd of them, defined as 60 or more reproductive units. Juvenile baboons rattled branches in a large tree before dropping to earth, chasing and challenging each other. When tired, they hopped on their mothers’ backs to rest, carried to the next feeding area. These primates have small sturdy fingers for pulling grass, 90% of their diet. As they sat and tugged at grass blades and seeds, our small group circled ever closer to observe and photograph. Warned only not to look directly at their eyes, we were able to come within ten feet of the large pack. 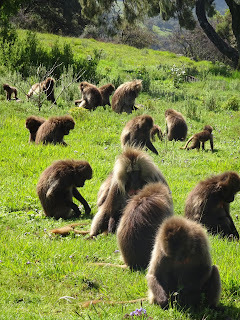 If bothered by our proximity, a baboon would simply slowly move away. All followed the lead of one dominant male as they crossed the field and disappeared below. Behind this stunning setting is a more complicated political balancing act. Created in 1969, the Simien National Park was also designated a World Heritage Site in 1978. As such, it is followed closely out of concern for rare birds and animals but also for overgrazing by sheep, goats, and other livestock brought into the park. 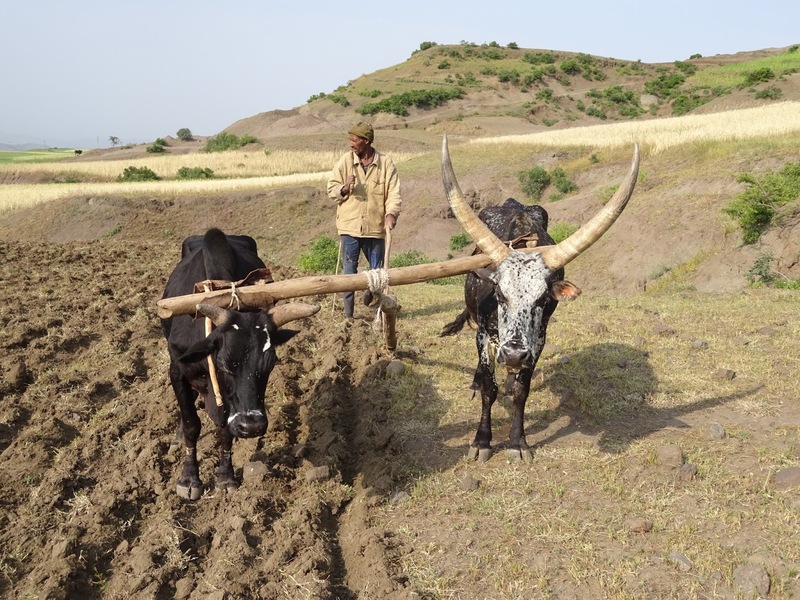 With 600 households or 3200 people residing in the park and another 1500 around the edges, over harvesting of natural resources and agricultural expansion are also problems. The need to bring human activities to sustainable levels requires finding alternative livelihoods for the park’s residents. According to our guide, many are being employed by the park services, teaching them respect for the value of the baboons in tourism. It has helped eliminate the common harvesting of baboons for clothes and food for dogs. Two park soldiers were hired to accompany us on our visit for protection from dogs. After ten days of service, they would return to their home and farms. 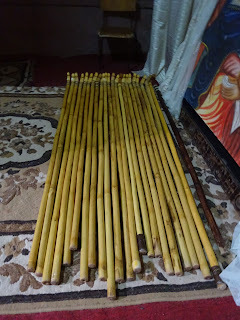 Handmade handicrafts were sold at the park’s store, giving badly needed income to local artists. These efforts have been supported by the Austrian government since 1997, a welcome and useful contribution by the international community. Tourism is rising as more discover this beautiful but fragile part of the world. There was a tenfold increase in numbers over the last 15 years, bringing more revenue for those who provide pack animals, guides, etc. A Tourism Master Plan was approved in 2007 to help prepare and direct the movement. It is being monitored by the World Heritage Organization that still rates the park as EN or endangered because of the high risk of extinction of the Ethiopian Fox and Walia Ibex. It seemed an African National Park Ranger must be part conservationist, botanist, zoologist, mechanic and diplomat, not to mention resourceful and creative. They are charged with protecting rare animals, birds and plant life with limited budgets while convincing locals of the need to cooperate. Visitors also challenge rules established to protect the environment. All this was obvious on our visit to the Simien National Park where we found a commitment to preserve the setting with local involvement. We can only hope for their success. Ninety-eight percent of Americans are descendants of immigrants. Some can trace their family tree back to Colonial days. Many came with the Germans and Irish at the turn of the 20th century. Changes in immigrations law in the last 30 years has meant more recent arrivals hail from around the globe and particularly, from Asian and Latin American countries. Each wave has benefited the economy of the United States as well as the richness of our cultural weave. And, they have brought their native foods, meaning it is no longer necessary to travel abroad to have a taste of foreign food, a benefit for all arm chair travelers. 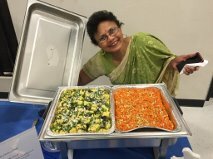 This varied menu was on full display at the International Night at Our Lady of Victory Catholic Church in Paris, an event to raise money for the church’s food pantry. Homemade ethnic food from nineteen countries lined the walls with recent immigrants next to 4th generation cooks sharing old family recipes. Nigerians in bright shirts and dashikis served pepper soup and moi moi made with black eye peas, a plentiful plant back home. Luis Frick wore a Swiss flag t-shirt, representing his mother’s heritage while sharing a hardy barley soup from his father’s Lichtenstein. Oriel Carey represented the growing Indian presence in Paris with popular dishes such as dhokla and carrot halwa. And, Eddie Clement, the lone American entrant, gave out corny dogs, claiming they were the only food offered on a stick with at least two food families represented. I went quickly for Honduran food, having discovered their savory tamales years ago. Native Daniela Leyva chose her selections carefully. The nacatamales are a traditional Christmas food, made with a blend of Spanish and Native foods – corn, capers, olives, chickpeas all wrapped in fresh banana leaves purchased in Dallas. An Honduran lasagna featured beans, fresh cheese and plantains, imported through Daniela’s employer, MIC Foods. Daniela and her husband, Carlos, moved to Lamar County from San Pedro Sula, Honduras in 2012 for his job with Prime Harvest. As an expert in aquaculture, Carlos assists with the company’s fish farm and Daniela works from home with occasional inspection trips to food processing plants in Latin America. Their two youngest children graduated from North Lamar and joined an older sibling at UT Arlington. The family has loved the ease of small town living and particularly enjoyed the friendliness of the community. They were happy to share food from their home country which ran out quickly. Lines rapidly formed for the large selection of Filipino offerings. Featured were roasted Pig, sticky rice, egg rolls, as well as dinuguan, a pork specialty cooked slowly and served with rice cake. (Don’t ask about the ingredients unless you really want to know.) Since Paris now has over 30 families from the Philippines, many were dressed in costume and helped serve and explain the dishes. More familiar were European offerings from Poland, France, Germany, Lichtenstein, Italy, and Czech Republic. The classic boeuf bourguignon from France, Italian meatballs, and corned beef and sauerkraut were popular. Freshly made chicken taco flautas and other Mexican favorites were available for the less adventuresome. Renee Iyaha stood ready to serve Diri Djon-Djon or Black Rice from her native Haiti. Dark, dried mushrooms were soaked in water later used to cook the rice. Other ingredients included shrimp, scallions, garlic, thyme, and parsley, used for flavoring. Guests that evening probably didn’t realize they were sampling party food, served at Haitian family gatherings, weddings and funerals. Rounding out the meal were fried plantains and grio or fried pork. Renee came to be in Paris via New York where she lived for 16 years. Paris Regional Medical Center recruited her to work as an RN in the coronary care unit. As she reads of early snows up north, she is grateful to be in Texas with no need of a snow shovel. And despite being surprised at the early closings of stores, Renee has easily adjusted to small town living. “No problem at all,” was her comment. And, it was no problem at all enjoying the rich selections from around the world. A shared meal, especially one filled with homemade fare, brought us all together. And, in this world of fear and suspicion, we need more of these occasions to recognize our common humanity and the joy of cooking. I once had a Dallas friend suggest going to DFW Airport in the mornings just to watch the Emirates Airlines Dubai-DFW flight land. The airline uses the Airbus A380 for its long distance hauls, the giant of all commercial planes that seems to lumber onto the runway. It can hold 550 passengers and the wingspan snugly fits into a football field. I always wondered who flew that exotic route until their fares got cheap and an opportunity beckoned. 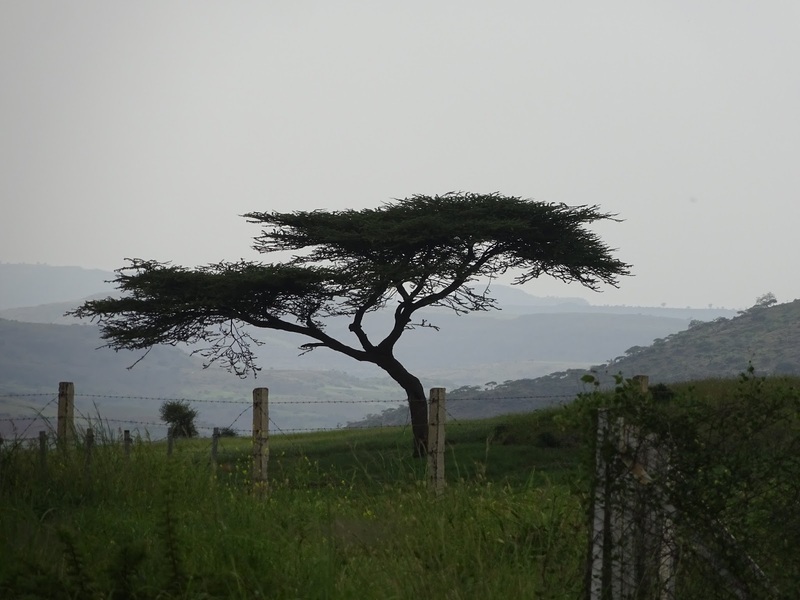 For under $900, we booked tickets to Ethiopia with an overnight stay in Dubai. The flight between DFW and Dubai is long – 14 ½ hours going and 16 hours returning. Yet, the Airbus offered a great movie selection and a surprising amount of room, even in the economy section. Plentiful bathrooms with soft lighting, adjustable water temperature, wood trim and faux marble countertops were available. Food menus offered Middle East and western choices. Emirates Airlines has a force of 13,000 international attendants, all living in Dubai. Only about 300 are Americans. On the flight going, we had representatives from twelve countries, including the United Kingdom, Ukraine, Singapore and Australia. 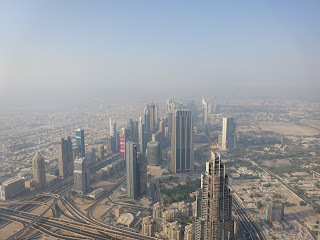 This diffusion of work among “foreigners” would be typical of everywhere we went in Dubai. Thanks to our American passports, customs at the Dubai airport was almost a wave through, requiring only a photo of our iris to be taken. The taxi driver to our hotel was Pakistani, as were the rest of our drivers. Another taxi ride took us to Burj Khalifa, the tallest building in the world, opened in 2010. 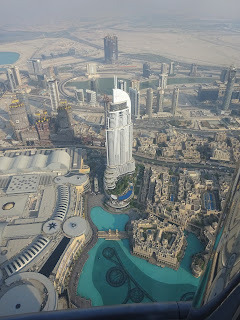 It is located in the Dubai Mall built in 2008. To make our 4:30 appointment, we had to hurry through the huge shopping arena filled with familiar stores such as The Pottery Barn, Gap and Banana Republic. Yet, scores of gold stores and Arabic women’s clothing offerings confirmed our presence in one of the Arabian world’s great shopping cities. 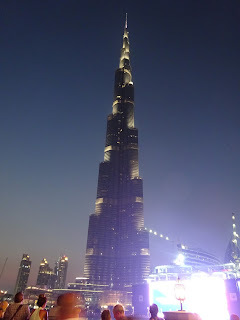 The crowd going up the Burj Khalifa was a mix of foreigners, mostly independent travelers. The only tour I saw was of Chinese. 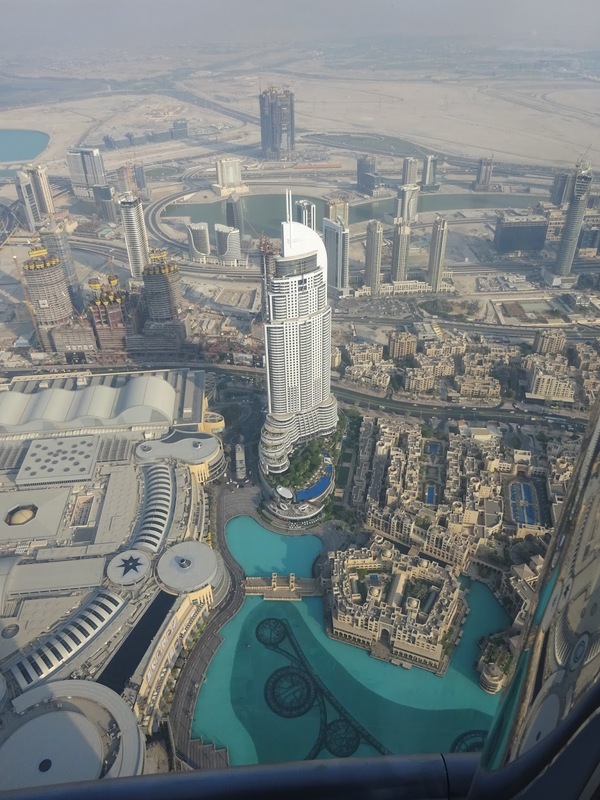 A smooth one minute elevator ride ascended, gently stopping at the 124th floor. Viewing was available inside and out. The best weather in Dubai begins in October with clear skies. Unfortunately, our September visit was still during days of dust storms. 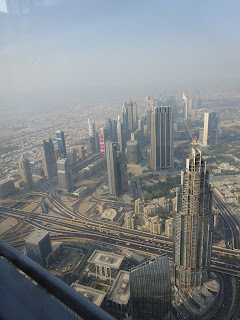 Visibility was adequate for about two miles, allowing us to take in the wonder of Dubai architecture but not the famous Palm Islands built into the Persian Gulf. 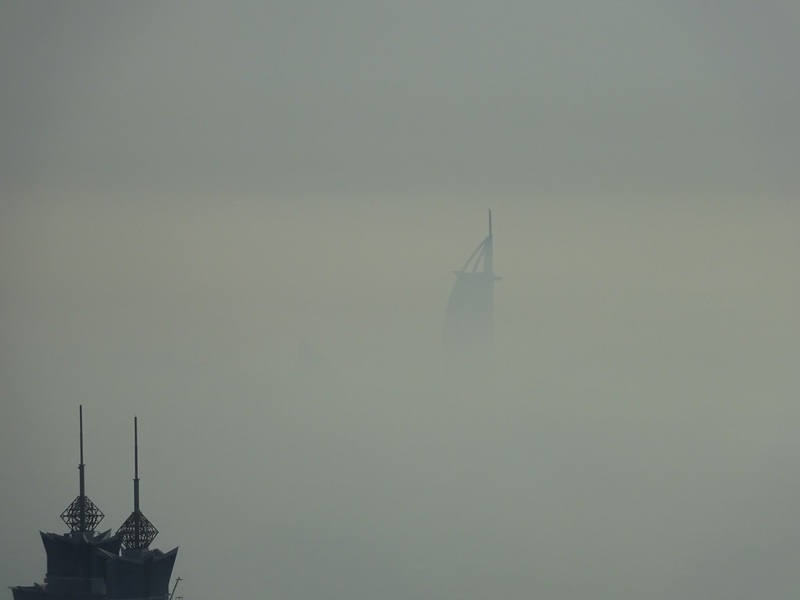 In the distant, the Burj Al Arab, the world’s only seven star hotel, appeared to be sailing through the dust. Telescopes were available for real time viewing but also revealed the land before development – a scant 10 to 15 years ago. Until 2004, when Mohammed bin Rashid Al Maktoum decided to make his country into a business showpiece, the barren desert reached up to the shores. Since then, constructions cranes can hardly keep up with the building. At one point, Dubai had one-fourth of the world’s cranes working on its development. Despite the added hotels, the average price is still $300 per night, going as high as $1600 for a night at the Burj Al Arab. Our glasses fogged up from the heat when we stepped onto the balcony area of the Khalifa. Selfies dominated as visitors of all ages and colors wanted photos of their faces silhouetted against building tops and hazy sky. Narrow windows were available for those who wanted to slip cameras through and take pictures without glare of the glass. Upon return to earth, we heard a call to prayer in the mall but without many apparent takers. Our next Pakistani taxi driver provided inside information on living in Dubai. Workers from different countries self-segregate in housing and even in sending their children to schools with their own teachers. They won’t combine into a public school , he said, as religion must be taught there. Most Pakistani workers are men and don’t have family in Dubai because of the expense. The population of the United Arab Emirates is about three million native born and six million foreigners. 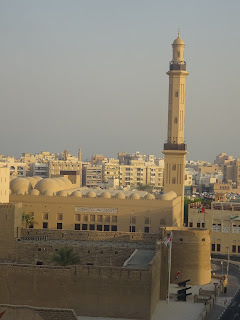 We arrived at the Dubai Museum in the tiny historical area that has been preserved. Located in the oldest building in town, the fort museum is well done and takes you from Bedoin tents to modern architecture. A video documented changes in the city by decades. And a display of 3,000 year old pottery found in the area confirmed the location’s long history of trade. A free Koran was given at the museum’s exit. 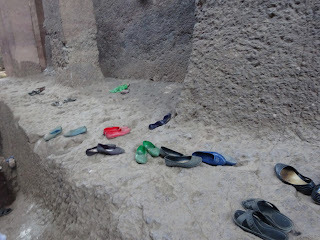 We had hoped to make the gold souk but lack of sleep caught up with us. Instead, we walked the streets near our hotel, filled with gold stores, each store filled with buyers. Dubai was an early trading center for jewels beginning with pearls but now gold dominates. Prices were by the ounce but we weren’t in the market – at least not that night. But it had been a beautiful introduction to Dubai’s offerings and maybe there will be another chance, especially if Emirates Airlines stays competitive. 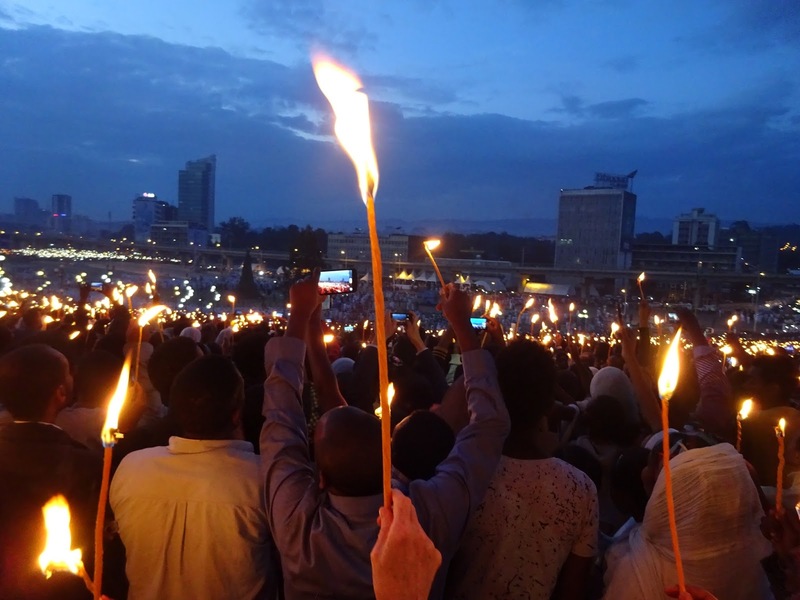 In Ethiopia, the word meskel has a triple meaning. It refers to a beautiful yellow daisy that blooms in September. Flying into Ethiopia’s capital, Addis Ababa, fields of the golden flowers were visible from the air. On a spiritual level, meskel means cross in Ge’ez, the ancient language of the Ethiopian Orthodox church. 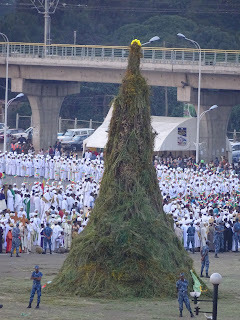 The final understanding of Meskel is the festival held in September to celebrate the finding of the true cross in the fourth century AD by Queen Helena, mother of Constantine, First Christian Roman Emperor. 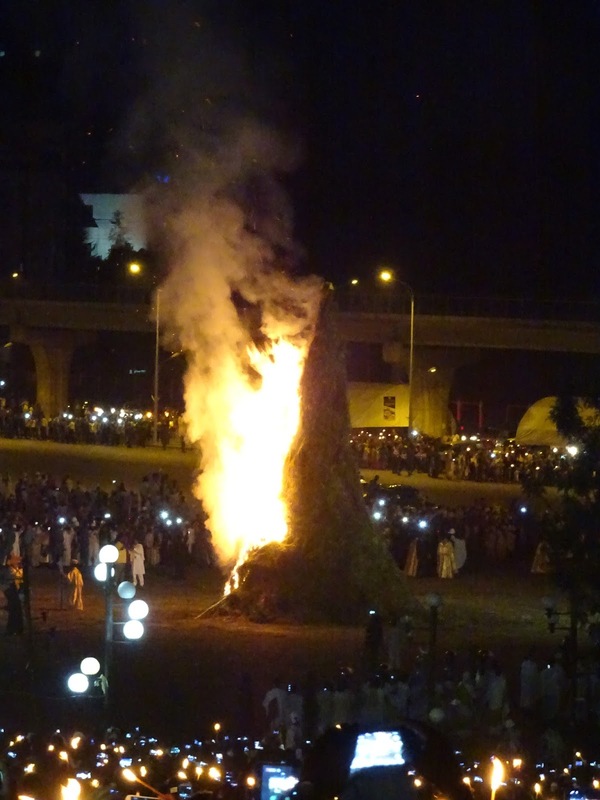 Tradition holds smoke from a bonfire in Jerusalem led Helena to find the cross on which Jesus was crucified. Parts of this cross are claimed in churches throughout Europe and Ethiopia’s remnants are kept in the Gishen Mariam monastery to the north of Addis. various hues but of the same ilk. Hiruy Zemichael and Semeone Tegegne picked us up at 3 p.m. They are members of the newest Rotary Club in Addis, one of ten in the city. Their club is bilingual, meaning they will conduct the meeting in English if there are any visitors. I was sure they had studied abroad as their conversation made easy reference to American colloquial expressions such as “what’s happens in Las Vegas stays in Las Vegas” and they could express dismay at the idea of a Donald Trump presidency. I was assured their fluency resulted from hours of watching American movies, comedians and reading English books and newspapers. Through the evening more Rotarians joined us including Ruth Dressiegn, who had just returned from New York where she spoke to a UN committee on the need for more youth to be involved in the sustainability project currently being considered. Another young woman, Rahel Getachew, will travel to the U.S. soon to represent all of Africa’s Rotaryact clubs. 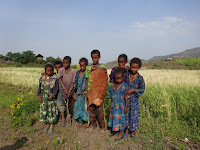 The club members were all educated, working in technical fields as well as social services. 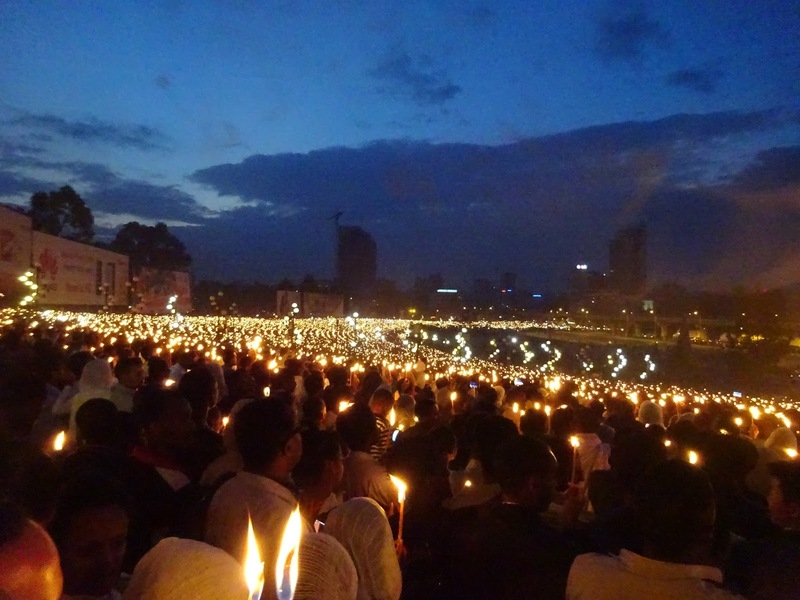 And, all wanted us to understand the Meskel event and its significance for the country. Streets closings made easy walking as we approached the square and candles were distributed. The square had almost filled even though we arrived an hour early. A large military presence watched from strategic points as fire trucks and ambulances awaited the call. Large open space in the middle would later welcome bands, church choirs, veterans, and rows of priests and deacons. A large central viewing platform held an impressive array of dignitaries - Abune Mathias, 6th Prelate of the Ethiopian Orthodox Church, Teodros II, 118th Pope of the Coptic Orthodox church in Egypt, and Dr. Mulatu Teshome, president of Ethiopia. 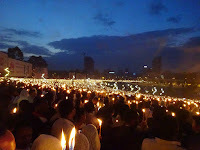 Through the darkening late afternoon, waves of chanting, swaying, dancing choirs passed in front of the stage. 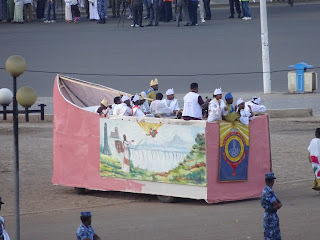 Floats reflected the story of Queen Helena’s discovery of the true cross. Those with hearing disability performed their sign language. 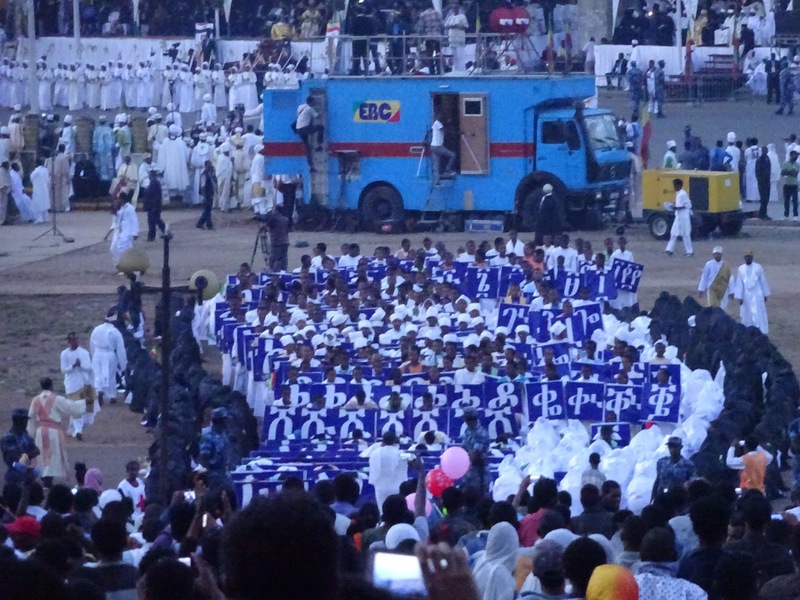 Occasionally, the crowd sang and clapped along with well-known chants. And, a marching band complete with tubas and brass melded into the big parade. It was a beautiful blend of a mass at St. Peter’s square in Rome and Macy’s Thanksgiving parade. 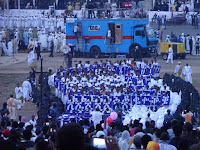 Since I couldn’t see easily over the crowd, I relied on photos and movies taken by Semeone to enjoy the details below. I could hear the Patriarchs and President talking. Amazingly, their speeches were translated into English. 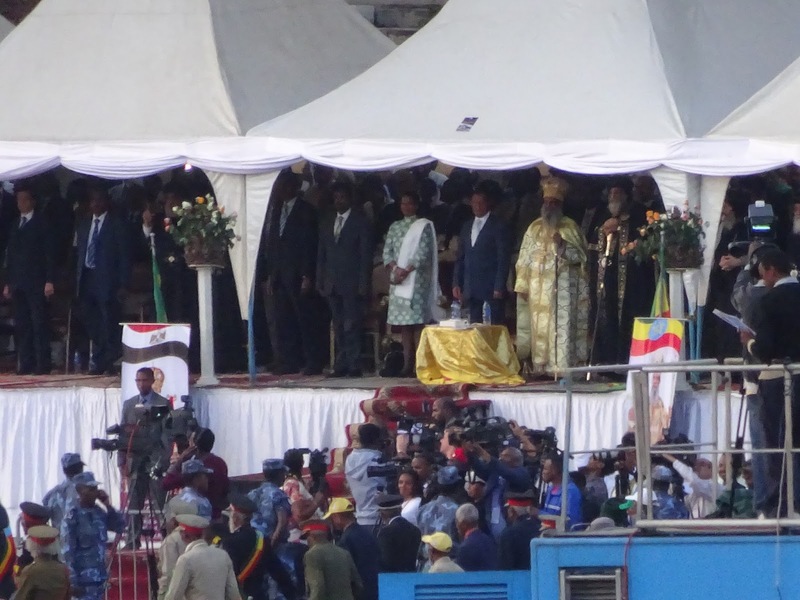 President Teshome talked of Egypt and Ethiopia being joined by the Nile River. 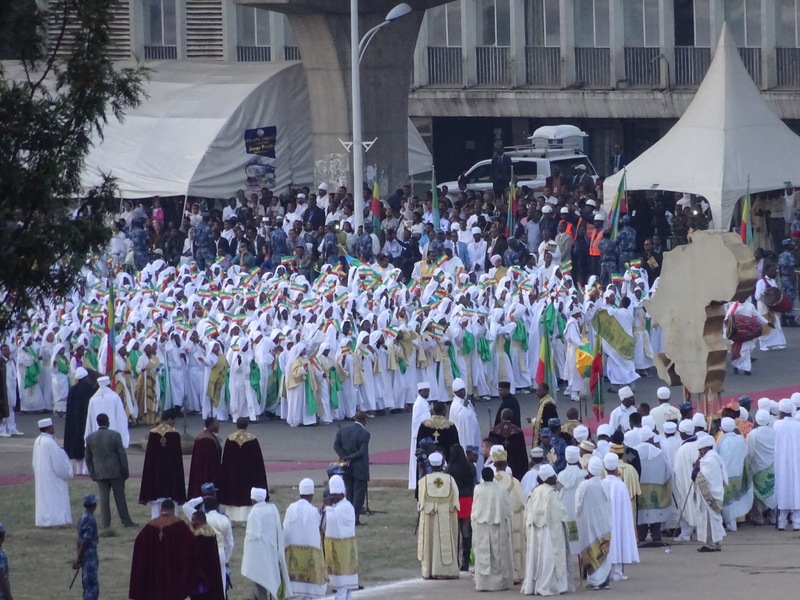 The Ethiopian Patriarch spoke of love between the orthodox communities. There was even mention of climate change and separation of church and state. 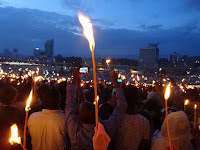 In the early evening dark, our candles were lit from neighbor to neighbor, a process that began at one end of the square and swept across the crowd like a moon rising. Patriarch Mathias slowly walked to the bonfire, circled and lit it, creating an immediate heart of flames amongst us. For the moment, all were united in its light. The spell was broken as our Rotary friends protected us from the large crowd exiting. On the walk back, they described the meal their extended families would share the next day with traditional food and how all would dress in white. Their homes would have small bonfires as would most hotels and restaurants. One suggested it was similar to our Thanksgiving Day gatherings. 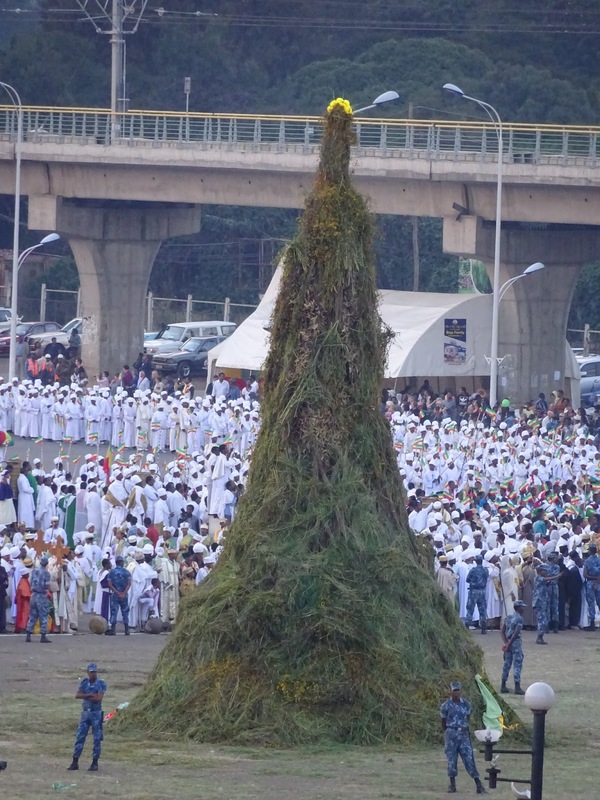 The Meskel celebration is one of Ethiopia’s finest. We were lucky to join this 1600 year old tradition, guided by a new generation of Ethiopians. It was a wonderful fusion of old and new and Ethiopia should be proud of both.